Looking for some fall fun this weekend? The Wharf has you covered! 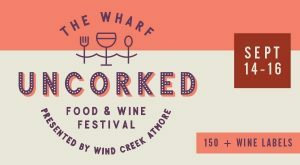 The Wharf’s events this weekend include the Uncorked Food and Wine Festival from September 14th – 16th and a special performance by Eric Church on September 16th. Contact Sugar Sands Realty & Management for rentals in Orange Beach and Gulf Shores. Give us a call today at (800) 824-6462. Lastly, we hope all of our friends, family and guests in Texas and Florida are doing well with storm relief from Hurricane Harvey and Hurricane Irma.